With a seven-game winning streak (including wins against Denver, Golden State and Utah  twice - all without LaMarcus Aldridge), the Portland Trail Blazers are finally at 12-12. I know it's not much, but if not for a stretch where they lost 9 of 10, their record would've been much better. Considering their 9-3 home record and 9-6 against West teams, I really feel they have a legit shot at making the playoffs this year even without Greg Oden. It's high time for all PEx Blazer fans to unite (which means me and... me) and chart the development of the young Portland squad as they inch their way into a playoff spot. Music critic Jon Landau, after attending a concert in May 1974, wrote, "I saw rock and roll future and its name is Bruce Springsteen." That was more than a year before Springsteen released Born to Run. Tens of millions of records sold, countless concerts and more than three decades later, "The Boss" is an icon who continues to produce top-selling albums with his buddies in the E Street Band. Nothing, except that, to borrow the line from Landau, Utah Jazz fans at EnergySolutions Arena on Tuesday night saw the future of the NBA and its name is the Portland Trail Blazers. The Blazers are young and brash yet play under control in coach Nate McMillan's system. Their opening-night roster had an average age of 24 years and 26 days, making them the youngest team in NBA history. Yet, after a rough start, they are nearly back up to .500 on the season and are on a six-game winning streak  and that's without their can't-miss, All-Star prospect, Greg Oden, who is out for the year recovering from knee surgery. "We know we have potential," said McMillan after beating the Jazz on Tuesday. "We know we are growing up and learning how to play the game of NBA basketball and playing together." In their two wins over Utah this week, the Blazers' top scorer and rebounder, second-year forward LaMarcus Aldridge, sat with a foot injury.  Oden, a 7-foot man-child, is expected to recover fully and will likely be a force in the league for years to come. After playing at Ohio State for one season and helping the Buckeyes to the national title game, Oden entered the draft as the most heralded prospect since LeBron James. He's just 19, and his rehab from knee surgery is reportedly going well. If anything, it's going too well and he's getting into too good of shape. Oden has reportedly gained 30 pounds of muscle and is now 280 pounds.  Last year's rookie of the year, guard Brandon Roy, has a strong all-around game and the ability to lead. He came into the league a bit more polished than most rookies after a four-year college career at Washington where he was the Pac-10's Player of the Year as a senior. Still, he's just 23.  Aldridge was the No. 2 pick in the 2006 draft and has shown a marked improvement in his low-post moves and scoring. He's averaging about 10 more points and three more rebounds per game this year than he did as a rookie. The former Texas star is 22.  Travis Outlaw has more NBA experience than most of his teammates. The 6-9 forward is now in his fifth NBA year and is having his best season, averaging 11.5 points and 5.1 rebounds. But for all his time in the league, Outlaw is still just 23, having gone pro right out of high school.  Martell Webster, the athletic 6-7 forward who torched the Jazz for 25 points on Tuesday night and made five 3-pointers, is only 22. He's in his third NBA season after skipping college as well.  Three of the Blazers' top players off the bench are 6-11 forward Channing Frye, who is 24, guard Jarrett Jack, 24, and Spanish point guard Sergio Rodriguez, who is 21. "We feel good about where we are and what we are doing," said McMillan. "I think this team can continue to grow and improve and that's the whole goal right now, to continue to grow and develop." Portland had a run of having players of questionable character, leading to many arrests and the term "Jail Blazers." But the franchise has weeded out the problems and started over. They also are owned by billionaire Paul Allen, one of the founders of Microsoft, who isn't afraid to spend money on his team. "They're a young team trying to establish themselves, trying to play and have fun," said Jazz coach Jerry Sloan of the Blazers after Tuesday's loss. "It's kind of how (the Jazz team) was last year." With the Blazers and the Jazz in the same division, there should be some epic battles between the two clubs for years to come. And while the Blazers may be the NBA's team of the future, they aren't bad right now, either. Springsteen has become a legend. There's a good chance the Blazers of the 2010s will become legendary as well. The hottest team in the NBA is not the Boston Celtics, San Antonio Spurs, Detroit Pistons or even the Orlando Magic. That team tucked away in near obscurity in a city located near the confluence of the Willamette and Columbia rivers in the state of Oregon is on a six-game winning streak. Yes, those same Portland Trail Blazers tagged with so many labels over the years. First it was a team that was jinxed because of the injuries that slowed the career of center Bill Walton, shortly after Portland won the 1977 NBA title and visions of multiple championships ended with Walton's injuries. The jinx continued when the Trail Blazers selected center Sam Bowie second overall in the 1984 NBA Draft. Not only did Bowie's promising career fail because of injuries, but the Trail Blazers selected Bowie instead of Michael Jordan. Of course, the supposedly jinxed Trail Blazers had the No. 1 pick in this past NBA draft, and they selected Ohio State center Greg Oden. As fate would have it, Oden is out this season because of microfracture surgery on his right knee. So the critics set the Blazers' clock for another season of doom. The Blazers had other ideas. Nate McMillan, one of the most underrated coaches in the game, left the comfortable confines of Seattle after five years (and because the SuperSonics would not grant him a larger contract) for Portland with all of its issues of a jinx. He also joined an organization with players who ran afoul of the law. It was humiliating to the organization. They even were called by many the "Trail Gangsters" because of so many off-court issues. McMillan became the new sheriff in town, and many players with soiled reputations were traded. The Trail Blazers took on a youth movement, played through the growing pains and here we are with one of the best young teams in the league. After losing four straight, the Trail Blazers went on their six-game winning streak, the Trail Blazers' longest streak since an eight-game run in 2002. The Blazers shot better than 50 percent and averaged 107.4 points during the streak. The Blazers are built for the future thanks to a roster with Brandon Roy, last year's rookie of the year, LaMarcus Aldridge, Mar tell Webster and Travis Outlaw, who has become more than just a dunking machine. Outlaw av eraged 19.8 points per game during the str eak. He's just one of a number of young talented players that will continue to brighten the Trail Blaz ers future and help rid the organiza tion of an un deserving jinx label. ^ yah brandon is really sizzling, not only this conference but even the last one. webster is also a good player, I hope his game will not change like what happened to Boris Diaw, who has a good conference last time but struggling already. Hope to see more games from them. I'm not a fan of them by the way, I'm a Mavericks and hawks supporter, but I like the way they play. my, my the blazers won their 8th straight, courtesy of great pointguard Brandon Roy, beating CP3's Hornets. They are already half game away with the Jazz for the number 8 spot overall in west and number 2 spot on their division. What a comeback, without oden. ^^ As far as I know, hindi point guard si Brandon Roy. He stands 6'6'' and plays the shooting guard position. 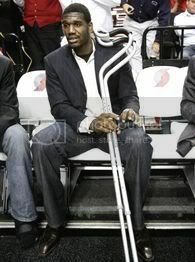 Is it true that Oden is injured? I really doubt. Maybe there are hidden agendas why Oden sit out the whole year. ^ Hmm. Like what agenda? ang galing ni Brandon Roy talagang sobrang lupit maglaro siya siguro ang best player of the week sa Western Conference. Sa sobrang depth ng roster ng Western Conference Team sana makuha siyang reserve sa ALL STAR GAME sa New Orleans. ^ Brandon Roy has been named Western Conference Player of the Week for two weeks running. The last Blazer to win the award back-to-back? Clyde Drexler. Roy's natural position is SG, but he occassionally plays PG especially in the 4th quarter. There's really no reason for Oden to sit out an entire year if he's not injured. And speaking of Oden, the last report is that he's already added 30 pounds of upperbody muscle which has caused concern from the Blazers coaching staff. They're afraid he might be growing too big. Kaya ko ring magpanggap ng ganyan. Why don't you just explain your conspiracy? HOTTEST TEAM in the league. They have a lot of confidence, considering they are missing Greg Oden and Lamarcus Aldridge. Why would Portland or Oden himself take away a chance to play for a full season? Everyone knows that even the best players still need to get acclimated to a grueling 82 game season. Not playing will hinder Oden and Portland's development. He is their future franchise player after all. It'll be interesting how much further they can go after they add Oden and another superstar in the future. Pagkakaalala ko may space sila to add one in 2 or 3 years time. Mahirap lang niyan pag hindi naging maganda career ni Oden ano kaya ang cause? Overrated o dahil sa injury? Blazers team future looks promising. I guess the development of those young guns and Roy establishing himself as one of premier players in the L. And Oden hasn't played a single minute yet. Wow. I like Webster and Outlaw. Ganda silang panoorin. if they reach the payoffs this year, then they'll be even better once oden plays next year.. i simply can't wait for next year for the blazers!! !